The Babington Stock Pot Station was designed as part of the larger Disaster Response Mobile Kitchen Trailer (DRMKT) development effort. This effort to increase personnel efficiency and comfort resulted in technological advancements never before seen in diesel fired, military cooking equipment. The Babington Stock Pot Station embodies these advancements and is a key appliance in the DRMKT. In addition to the DRMKT, the Stock Pot Station is integral to the Babington A-Ration capability Pallet; another ongoing developmental effort intended to augment the Air Force Single Pallet Expeditionary Kitchen. 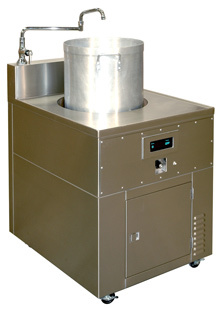 Designed to securely hold a 15-gallon military or commercial stock pot, the Stock Pot Station offers simmering, stewing and boiling capability, without the attendant noise and excess heat associated with conventional open flame burner pot cradles. The standard M1959 field range stock pot cradle consists of an aluminum pot cradle, and an open flame burner placed directly beneath the stock pot. This particular arrangement has been in use by the military since 1937. Although widely used, the open flame burner assembly is far from ideal. Noise and excessive wasted heat are characteristics of the traditional stock pot cradle and burner assembly. The Babington Stock Pot Station utilizes the same Airtronic burner used in all Babington military appliances, but housed securely within an insulated cabinet. All combustion gases are retained inside the cabinetry, where the high efficiency heat exchanger ensures all heat is directed toward the stock pot itself. The clean, smoke and odor free exhaust is subsequently channeled out of the cabinetry through a stainless steel exhaust port, where they can be captured and directed outside the cooking tent or facility. The Stock Pot Station cabinetry is so well insulated that very little noise is heard by cooks or passersby. 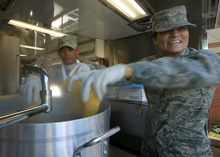 This provides the military cook a nearly silent stock pot capability that operates on the same battlefield fuel as other feeding systems, and requires a minimum of electrical power. Stock Pots are used to prepare a variety of menu items. Some examples include scrambled eggs, soups, sauces and gravies, chili, stew, coffee, tea and hot chocolate. Thermostatically controlled heat directly to the underside of the stock pot. No heat escapes from around the stock pot itself. Internally plumbed for potable water hook-up. The Babington Stock Pot Station can operate at very low warming temperatures to a high of 450 degrees for grilling and searing of meats, prior to stewing. Most stock pot based cookery requires cooking temperatures of 180 to 350 degrees. Fresh Food Preparation. A great variety of fresh prepared menu items can be prepared in the Babington Stock Pot Station. Simply follow the directions of the recipe. Observe the LED Display frequently to monitor actual cooking temperatures and adjust accordingly. Simmering, boiling and stewing can all be easily performed on the Stock Pot Station. Use it as you would any commercial or military Stock Pot. Burner System. The Stock Pot Station comes with an Airtronic burner with the capacity to heat the stock pot to any target temperature up to 450 degrees. The burner is installed beneath the cooking surface and behind the front panel of the insulated and sound-proofed cabinetry. The burner is mounted in the same fashion as all Babington military appliances. As such, it is capable of being quickly and easily removed for maintenance or replacement. The Airtronic burner meets Underwriter Laboratories (UL) Standard No. 296. Fuel Utilization and Consumption. The Airtronic burner is self-priming and operates on the complete family of distillate fuels. These include, but are not limited to, DF1, DF2, arctic, and JP8 diesel fuels. The Airtronic burner has a variable firing of .2 gph - .6 gph. Adjusting the firing rate is accomplished with a single screw-type mechanism. No parts changes are required. The high efficiency heat exchanger in the Stock Pot Station allows a medium burner setting (about .40 gph) to satisfy all cooking requirements. Voltage and Current. The Stock Pot Station operates on 120 VAC, 50/60Hz, with a maximum current draw of about 250 watts. Safety. The Stock Pot Station is safe to operate. Because it is nearly silent, caution must be exercised to avoid unintentional operation. Monitor cooking temperatures closely to avoid accidental overheating and scorching. Avoid spilling grease on or near the stock pot station during operation or while the heating well remains hot. Noise. The Stock Pot Station does not produce measurable noise when operating, as long as the stock pot remains in the heating well. Weight. The weight of the Stock Pot Station is: 310 pounds. Dimensions. The Stock Pot Station appliance is 49” x 34” x 36.5” Allow six additional inches for castors. Materials. The Stock Pot Station is made from corrosion resistant, food grade stainless steel. Materials used meet food contact surface requirements as specified in NSF International Standard No. 51, See Chapter 4, section VI, TB MED 530. All outside surfaces of the Silent Griddle are easily cleanable. Electrical Wiring. Electrical wiring in the Stock Pot Station conforms to the requirements of UL Standard No. 62, and is arranged, supported, and marked to allow identification with the wiring diagram. Maintainability and Repairability. Routine maintenance and repair of the Stock Pot Station requires only standard hand tools. All electrical and control elements are conveniently located to offer ease of accessibility. Caution Labels. A caution label containing the words “CAUTION- MAY BE HOT” is securely attached to a readily visible location near the exhaust port of the Stock Pot Station. An additional warning label cautions against the use of gasoline as a fuel and is visible at the fuel inlet port of the unit. Welding. All welding performed in the manufacture of the Stock Pot Station is in accordance with the requirements of AWS Standard No. D1.6. Operating temperatures. The Stock Pot Station is operable and functional at ambient temperatures of 50°F to + 120°F. Altitude. The Stock Pot Station is operable at altitudes up to 8,000 feet above sea level with proper air mixture adjustment. Rain. The Stock Pot Station is operable after being exposed to rain. Corrosion. The Stock Pot Station is made of high grade stainless steel. As such, it should suffer no penetrating corrosion, deterioration, clogging or binding of moving parts, or change in tolerance limits on any internal or external parts when exposed to a corrosive environment. Vibration. The Stock Pot Station will remain operable after being subjected to vibration. Power Cord. The Stock Pot Station is equipped with a fuel and water resistant, 16 gauge, 3-wire, 12-foot long power cord. The cord is capable of supplying sufficient power to operate the Stock Pot Station and conforms to UL Standard No. 62; and flame resistance requirements of MSHA, Title 30, Part 18, Section 18.64, Part 7, and Subpart K, Section 7.407.